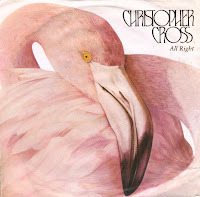 At the time of its release in February 1983, I thought that Christopher Cross's 'All right' was one of the dullest songs on the planet. But 27 years later, you can see that I've changed my mind. The fact is, these days it's hard to find any melodic pop songs anymore and it's good to be able to travel back to the early Eighties via singles like this. 'All right' is a track from the album 'Another page', also released in 1983. It reached number 16 in the Dutch Top 40 and number 51 in the UK singles chart. 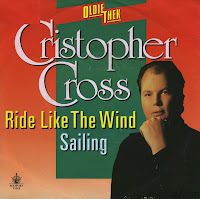 'Ride like the wind' was Christopher Cross's debut single in 1980. It was a track on his self-titled debut album and featured backing vocals by Michael McDonald. Christopher Cross dedicated this song to Lowell George, formerly of the band Little Feat, who died in 1979. The single reached number 69 in the UK singles chart. 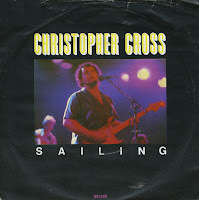 On this German 'oldies' single, it is coupled with 'Sailing', a later single by Christopher Cross which is described here. Christopher Cross released his debut album in 1980. 'Sailing' was released as the second single from that album, and was a great success: it reached number 1 in the US Billboard Hot 100 chart. Meanwhile, it reached number 48 in the UK singles chart and number 18 in the Dutch Top 40. The song won a Grammy Award in the US for 'Song of the year' and 'Arrangement of the year', while Cross won the 'Best new artist' award. 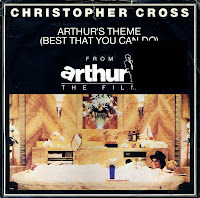 'Arthur's theme' was written in collaboration between Christopher Cross, pop music composer Burt Bacharach and his frequent writing partner Carole Bayer Sager. A fourth writing credit goes to Minnelli's ex-husband and Australian songwriter Peter Allen, also a frequent collaborator with Bayer Sager. The single was taken from the soundtrack of the movie 'Arthur' starring Dudley Moore and Liza Minelli. It reached number 1 on the US Billboard Hot 100 chart, number 7 on the UK singles chart. It was one of the first songs I recorded from the radio with my new tape recorder which I got for my eleventh birthday. Almost 28 years later, I've got the single!